Part of the Gun Rocks funding was earmarked to increase the knowledge of archaeological survey techniques for club members. 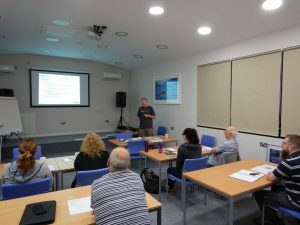 Although some members already had some Nautical Archaeological Society training, many didn’t and we chose the BSAC Wreck Appreciation course as a good starting point. While this course focusses on wrecks where there is a recognisable vessel and not just cannon, the basic techniques for mapping and recording the artefacts are the same. Classroom based skills, day 1 of the Wreck Appreciation Course. 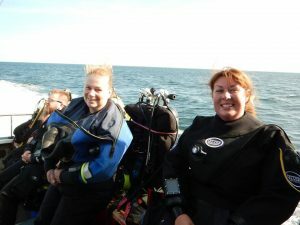 The course consists of a day of theory and dry practical lessons, followed by a day of diving and putting the techniques into practise on a suitable wreck. We spent Saturday 19th August hidden away in the lecture room of the Diving Centre in Boldon; learning all about how to locate wrecks, what we should expect to find and how parts of the wreck should fit together, what law governs activity on wrecks, and how to conduct a practical survey. After many hours discussing kit configurations, and practising how to use tape measures and distance lines in silence, we felt prepared enough to venture into the water the next day. Sunday 20th turned out to be a good day for diving: a slight breeze and a bit of sun. Boarding Spellbinder, we set off out of the Tyne, heading for our target wreck: the Lonclara. PLA Hopper No 20 was a Port of London Authority hopper barge, which was converted to a cargo steamer and renamed the Lonclara in 1916. On 4th January 1917 it hit a mine laid by UC-31 and sank off Hendon Rock (Sunderland) with the loss of 4 lives. 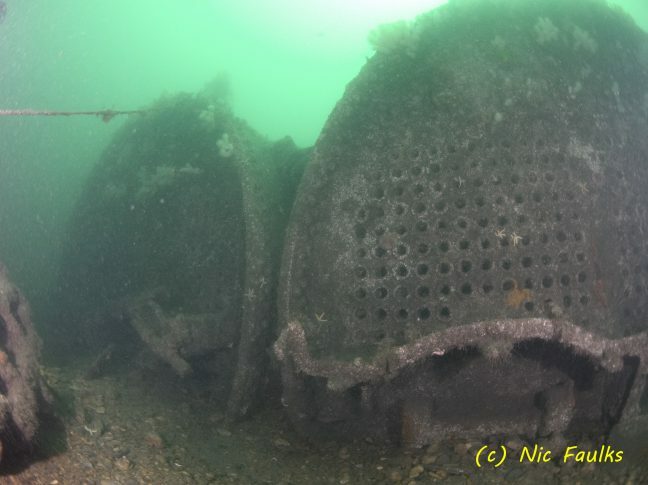 It now lies in 2 parts in a minimum depth of 15 metres; and we chose to dive the stern section, where the boilers, engine block, propeller shaft, propeller and rudder are all still easily recognisable. The 2 survey teams jumped in, and spent dive 1 working out how the wreck was lying, where each part was in relation to the next, sketching the sit, and considering how best to accurately map and measure a section of the site. After a surface interval spent drawing plans for the measuring phase, and working out how best to carry the collection of tapes, lines, slates and weights; the 2 teams were ready for the real work. Happy ladies on the practical skills day of the Wreck appreciation course. A little after slack, there was a greater depth and a bit more current this time, but there followed 45 minutes of frantic line laying, measuring and recording; with each team taking a different part of the wreck. Back on board Spellbinder, the usual Spellbinder lunch of chicken curry and rice disappeared quickly as we headed back to the Tyne and the 2 teams each compiled their plans; which conveniently overlapped. Success! With some adjustment to the scale, the 2 plans matched up where they were meant to, and we had the start of an accurate plan of the site; it takes more than 2 dives to map a whole site, but we had shown the techniques worked and would have produced a plan of the entire site over a series of dives. Whilst we won’t be mapping a ‘normal’ wreck on Gun Rocks, the techniques learned will be ideal to assist in accurately mapping the locations of all the cannon on the site. 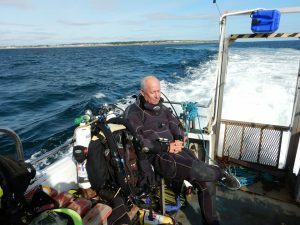 On July 30th 2017, we took the club rhib out for what we hopped would be a concerted weekend of diving on Gun Rocks to clear some of the cannon of seaweed, to photograph them and to work out how much rope we needed for the trail. Unfortunately the weather gods weren’t so obliging with us, nor was the moon god with her tide timings. We did manage to get two dives on Gun Rocks on the Saturday, clearing a couple of cannon and looking at the best way to get the trail laid. 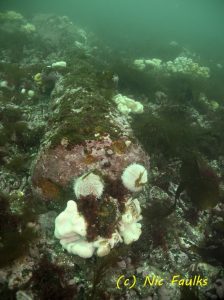 This was Paul’s first dive on Gun Rocks, so he was given a full guided tour of all of the cannon, including the new find from last month by Simon. It was all a bit swelly so it made taking photographs very difficult and the visibility wasn’t great. Admiralty Pattern Anchor covered with life and one side broken. 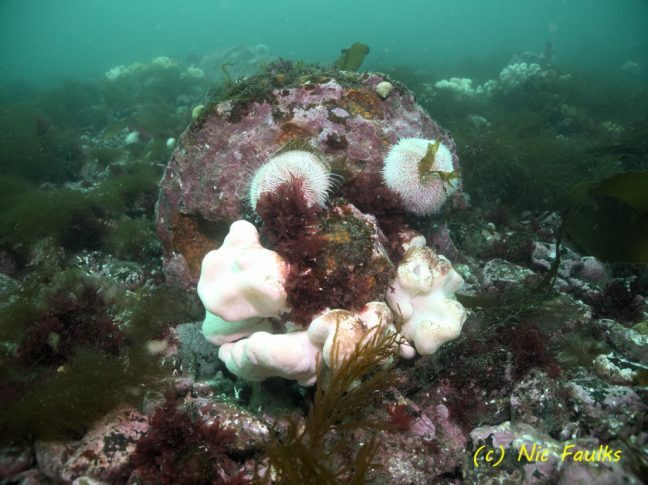 On the Sunday, Si and his buddy did their first dive on the Gun Rocks cannon, clearing the way for the trail to be laid as soon as the MMO licence is granted and checking that the marker buoy was safely attached. (Something we can put in for 28 days without a licence). After their dive, Nic and Paul caught slack in the sound. This dive is always a challenge, partly because you never quite know how long slack will last and secondly because the sea bed in the sound is quite featureless, making navigation quite difficult. We located seven cannon in the sound, all remarkably deteriorated, on the flat sea bed. We then found an Admiralty pattern anchor, which appeared to have had one side snapped off. Took lots of photographs of this. A new cannon found close to the slope up to Gun Rocks. Then…. then…. on the way back towards the shallows of Gun Rocks we found an 7th cannon lying in the sound!! It is positioned at the bottom of the slope, just below the main cannon site. Due to the swell and wind I couldn’t mark it, but took photos and tried to fix in my mind where it is, so I can find it next time. With Si’s find last month (the 14th cannon on the Gun Rocks site) and this find, that takes to number of cannon across the two sites (Gun Rocks and Staple Sound) to 14 +7 = 21 recorded cannon. The new finds also link the two sites more closely – there now is probably not more than 20 metres between the canon originally found in the sound and those on the shallow Gun Rocks. 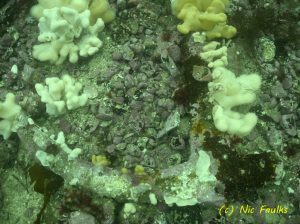 It just seems that every time we dive this site we find something else. One day maybe we will solve the mystery of the ship which sank with such a range of cannon on board.